The renowned British physicist, who died at 76, left behind a riddle that could eventually lead his successors to the theory of quantum gravity. And bet they did. In 1991, Hawking and Kip Thorne bet Preskill that information that falls into a black hole gets destroyed and can never be retrieved. Called the black hole information paradox, this prospect follows from Hawking’s landmark 1974 discovery about black holes — regions of inescapable gravity, where space-time curves steeply toward a central point known as the singularity. Hawking had shown that black holes are not truly black. Quantum uncertainty causes them to radiate a small amount of heat, dubbed “Hawking radiation.” They lose mass in the process and ultimately evaporate away. This evaporation leads to a paradox: Anything that falls into a black hole will seemingly be lost forever, violating “unitarity” — a central principle of quantum mechanics that says the present always preserves information about the past. Hawking and Thorne argued that the radiation emitted by a black hole would be too hopelessly scrambled to retrieve any useful information about what fell into it, even in principle. Preskill bet that information somehow escapes black holes, even though physicists would presumably need a complete theory of quantum gravity to understand the mechanism behind how this could happen. Thorne, however refused to concede, and it seems he was right to do so. In 2012, a new twist on the paradox emerged. Nobody had explained precisely how information would get out of a black hole, and that lack of a specific mechanism inspired Joseph Polchinski and three colleagues to revisit the problem. Conventional wisdom had long held that once someone passed the event horizon, they would slowly be pulled apart by the extreme gravity as they fell toward the singularity. Polchinski and his co-authors argued that instead, in-falling observers would encounter a literal wall of fire at the event horizon, burning up before ever getting near the singularity. At the heart of the firewall puzzle lies a conflict between three fundamental postulates. The first is the equivalence principle of Albert Einstein’s general theory of relativity: Because there’s no difference between acceleration due to gravity and the acceleration of a rocket, an astronaut named Alice shouldn’t feel anything amiss as she crosses a black hole horizon. The second is unitarity, which implies that information cannot be destroyed. Lastly, there’s locality, which holds that events happening at a particular point in space can only influence nearby points. This means that the laws of physics should work as expected far away from a black hole, even if they break down at some point within the black hole — either at the singularity or at the event horizon. To resolve the paradox, one of the three postulates must be sacrificed, and nobody can agree on which one should get the axe. The simplest solution is to have the equivalence principle break down at the event horizon, thereby giving rise to a firewall. But several other possible solutions have been proposed in the ensuing years. For instance, a few years before the firewalls paper, Samir Mathur, a string theorist at Ohio State University, raised similar issues with his notion of black hole fuzzballs. Fuzzballs aren’t empty pits, like traditional black holes. They are packed full of strings (the kind from string theory) and have a surface like a star or planet. They also emit heat in the form of radiation. The spectrum of that radiation, Mathur found, exactly matches the prediction for Hawking radiation. His “fuzzball conjecture” resolves the paradox by declaring it to be an illusion. How can information be lost beyond the event horizon if there is no event horizon? In 2013, Leonard Susskind and Juan Maldacena, theoretical physicists at Stanford University and the Institute for Advanced Studies, respectively, made a radical attempt to preserve locality that they dubbed “ER = EPR.” According to this idea, maybe what we think are faraway points in space-time aren’t that far away after all. Perhaps entanglement creates invisible microscopic wormholes connecting seemingly distant points. Shaped a bit like an octopus, such a wormhole would link the interior of the black hole directly to the Hawking radiation, so the particles still inside the hole would be directly connected to particles that escaped long ago, avoiding the need for information to pass through the event horizon. Physicists have yet to reach a consensus on any one of these proposed solutions. 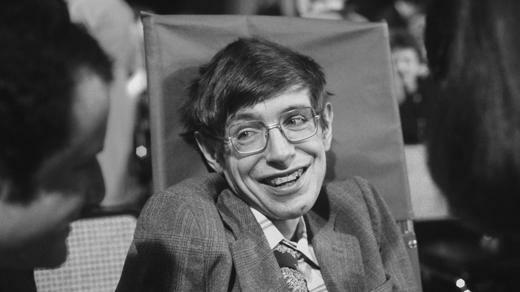 It’s a tribute to Hawking’s unique genius that they continue to argue about the black hole information paradox so many decades after his work first suggested it. Are We About To See A Black Hole? A project called the Event Horizon Telescope is analyzing data taken earlier this year using interferometry — and we may be remarkably close to "seeing" a black hole, says astrophysicist Adam Frank. Even with no one in charge, army ants work collectively to build bridges out of their bodies. New research reveals the simple rules that lead to such complex group behavior. Stimulating part of the cortex as needed during learning tasks improves later recall. The finding reveals more about the brain's memory network and points toward possible therapies. Mechanical tension between tethered cells cues developing tissues to fold. Researchers can now program synthetic tissue to make coils, cubes and rippling plates.